A Home Art Studio from Sheds Unlimited INC has begun serving the art enthusiasts of Perkasie, PA. The two story modular art studio is another product offered by the family owned storage shed manufacturer of Lancaster County, PA. Enter this Amish made home art studio in Perkasie, PA and you might want to make it a home or summer cabin! 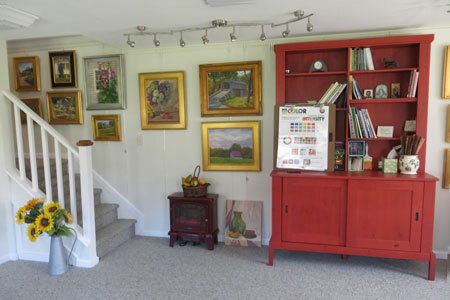 The two story modular shed from Sheds Unlimited INC of Lancaster, PA is home to the Maggie Leiby Fine Art Studio. It was a dream come true for this late-in-life art enthusiast even though the interior was bare wood and framing boards. But with a few thousand dollars and the hard work of Maggie’s husband, this at home art studio soon became a charming piece of art itself! Margaret began ponder the idea of a home art studio years after a night time dream awakened a passion in her which she did not even know existed. She dreamt of meeting Jesus at the end of her life and he asked, “Where are all the paintings?” A bit bewildered at the meaning, she awoke and began pushing her family towards art. It wasn’t until after she had enrolled her husband and sons in art classes that she discovered it was she that had the hidden talent. Maggie enrolled at Kennesaw State University in Georgia and graduated in 1994 with a BA in Studio Art. Her work as an artist took on a very important part of her life. Painting now became her favorite pastime and even a job at which spent countless hours learning and creating beautiful hand painted art. After moving to Perkasie, PA Leiby began painting in the basement of their home. 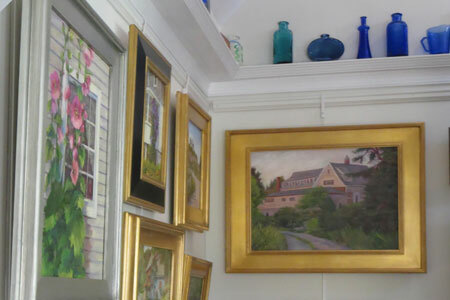 She opened an art gallery nearby as an outlet to display and market her paintings. However, the house was getting a bit tight and she needed a building with plenty of light and open space for a home art school. That was when she found Sheds Unlimited INC of Lancaster County, PA.
She visited the Sheds Unlimited manufacturing facility in Gap and was immediately attracted to the modular two story sheds which she thought would make the perfect at home art studio. It would allow her to have a private painting studio on the second floor with plenty of room and lots of light, as well as ample space on the first floor for the art school she was dreaming of. It wasn’t long until the customized modular two story building was on order. It arrived only weeks after placing the order and her husband went to work ordering materials to finish out the inside. After four months of work insulating, wiring and dry-walling the inside, the home art studio was ready to move into. It was an exciting day when Maggie began painting in her new brightly lit at home art studio! 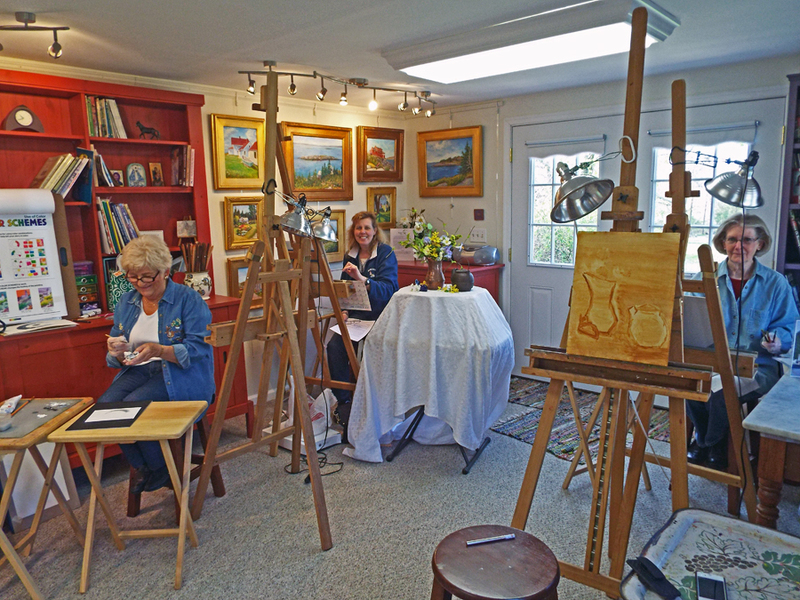 Today Maggie not only paints in her new home studio, she holds weekly classes in her backyard art studio every Thursday morning. Students set up their painting easels on the wide open first floor equipped with a small kitchen and decorated with lots of paintings on the walls. It also serves as a place for Maggie to display her artwork for anyone who might be interested. The painting continues and Maggie could not be happier with her home art studio shed. In fact, she tells how that when a problem arose with design of the two story shed, Sheds Unlimited came with a crew and some large equipment to make it right making her a very satisfied customer of Sheds Unlimited. Sheds Unlimited is a provider of home sheds and barns based in Gap, PA. With over twenty years experience in the industry, they continue to expand their products. Most recent has been the addition of potting sheds, summer cabins and home office sheds. Whatever the need, it seems this company is able to provide a solution. At least, that is what Maggie Leiby seems to think!